The idea of a radio series on the evolving enterprise came to me some months bac k while sitting in a cafe tucked away on Hawaii's North Shore where I was visiting my daughter, a marine biologist and soon-to-be mom. Scribbling in my trusty Moleskine notebook, I thought about the topics and how each connected to what I see are the seven vital things that enterprise leaders must know about the evolving innovation landscape. 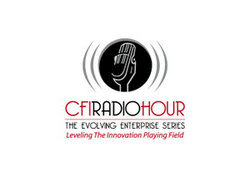 This Sunday, September 28 at 6:00pm (Pacific) marks the launch of The Evolving Enterprise series on BlogTalkRadio's Coach for Innovation show. I have some great guests lined up to dialogue with me on these seven vital areas and I'm delighted that Kate Roberts of The Wired Woman could join me between her speaking engagements for our topic The Evolving Enterprise: Making a World of Difference at Work. Enterprise leaders who want to make a difference in the workplace, in their companies, and in the world listen up and discover innovative ways to do so.